The last try to break the record was back in 2012 by a team in California where the efforts were thwarted at the last minute when the journalist covering the story broke the bubble machine. Farm Feast have no worries about any such occurrence and welcome all visitors to get involved in the action. This is yet another un-missable highlight added to this year’s already jam packed festival line up which includes everything from the much loved Sheep Show, a great selection of seasonal beers and ciders at the Beer and Cider Festival, a variety of thrift shops and craft stalls at the Vintage Village and learn how easy it is to live the good life in the Good Life Marquee. Not to mention the Chef’s Demo Stage, where some of the Northwest region’s most talented chefs will deliver exciting and varied interactive demos and masterclasses and the Little Feasters Zone has plenty to keep the kids entertained over the weekend from cooking workshops to treasure hunts. A new addition to this year’s Farm Feast, ‘Livestock’ takes place on the evening of 25th May from 7-11pm. The Lower Meadow will host headline act Peter Hook and The Light who are set to perform along with supporting acts Dan Croll, Stealing Sheep and Merseyrail Sound Station 2013 winners Soho Riot. With such a huge array of exciting attractions and events, Farm Feast and Livestock is not only set to be one of the best family friendly festivals of the year, but also a world record breaking one too. Farm Feast and Livestock are open to all ages, however under 16s must be accompanied by an adult to Livestock. 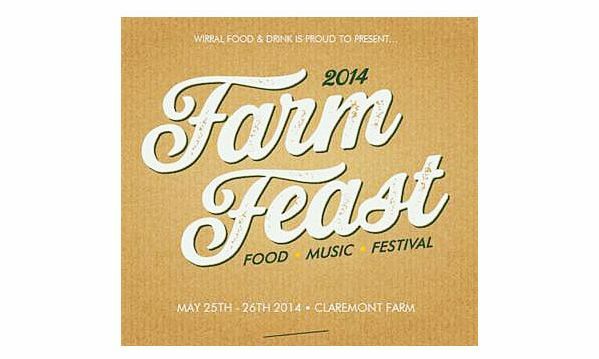 Previously known as Wirral Food and Drink Festival, the new and improved Farm Feast – although keeping quality local, seasonal and artisan food and drink at its heart – will this year evolve into a fully fledged family festival with two music stages, providing the perfect start to a summer of fun. For the grown-ups, Farm Feast will feature a Beer and Cider Festival, with over 40 ales and ciders showcasing the quality and diversity of the region’s brewers, and Liverpool’s renowned Berry and Rye and Aloha, will have a stunning range of cocktails on offer. Children will have their very own Little Feasters area, jam packed with interactive storytelling, bush craft workshops, cookery lessons and educational fun and games in the food and farming tents. The Good Life Marquee at Farm Feast will deliver a programme of demonstrations, talks and ʻhave a goʼ exhibits. This is set to be a fascinating and engaging area of the festival where visitors will have a chance to learn skills such as how to make sausages, brew beer and keep bees. The Chef’s Demo Stage will focus on clever cooking of fresh ingredients by some of better known chefs and cooks in the industry including Stefan Gates, Nisha Katona and Brendan Lynch, and a fantastic selection of traders will deliver a wide variety of street food that will celebrate the colours, flavours and styles of many cultures at an International Street Food Market on site. Other attractions will include Vintage Village where retro fashionistas can rummage through campervan thrift shops, learn to swing dance to gypsy jazz music or visit the tea tent and savour on vintage style street food. Elements of the old festival that visitors know and love, such as the farmers market, a wide variety of stalls from the region’s top food and drink producers and exhibitors, and the ever popular ‘sheep show’ will also be back for 2014. The Food and Farming Tent is one of the most popular areas of the festival, with live animals like calves, pigs and sheep. Farm Feast will feature main and acoustic music stages and a separate night time ‘Livestock’ music event. Two of Liverpool’s best known music promoters will programme the daytime stages – The Dovedale Social will present the Main Stage, showcasing an eclectic line up that ranges from talented amateurs to seasoned performers and Mellowtone will programme the Courtyard Stage, which will feature the best local talent and acoustic performances. Livestock, an evening festival style party in the great outdoors, will host an eclectic and alternative line up of performances from well known local bands to big name headliners. Farm Feast organisers are delighted to announce that Livestock will be programmed by Liverpool Sound City, hot on the heels of their yearly festival which takes over Liverpool City Centre every May in what is the largest metropolitan music and arts festival in the UK. Jay Hynd was voted Media Personality of the Year 2013 at The Liverpool Press Club Awards. He has recently joined the BBC after leaving Radio City 96.7 where he was well known for being a part of Rossie’s breakfast show team. He started out at Radio City working with the legendary Pete Price. He will be hosting his own show on Bay TV Liverpool when it launches on Freeview in May alongside Ellie Phillips. Scouser Ellie Phillips graduated with a Masters degree in Music Industry Studies from the University of Liverpool in 2011. She went on to found the Liverpool Music Awards, which are now in their third year. Recently, she was named “Young Business Woman of The Year 2013/2014 for the North West of England and Isle of Man” in the Forward Ladies Awards. Ellie is also an R&B/House DJ, and freelance music and entertainment presenter. Ellie is the female music and entertainment presenter for Bay TV Liverpool.